I have been living cheek by jowl with two queens for a dozen years now. They are both named Emma of Normandy, Queen of England. The first Emma lived in the 11th century. She was at the very root of the Norman Conquest, and her actions have been scrutinized by historians for about 900 years. The second Emma is one I’ve created: a character in a historical novel. Someone I’ve made up from the historical record, from legend, and from my own imagination. Both women are very real to me, each blurring into the other like some trick photographic image. The historical Emma lived a long and eventful life, most of it in England, although she was born in Normandy – hence her name. Twice wed and twice widowed, she lived through the reigns of seven kings of England and she was intimately involved with all of them. She married two of them, was stepmother to one, mother to two, and from two of them she had to flee for her life. Photo: Queen Emma flees war in England with her children. Manuscript Miniatures. Cambridge University Library. 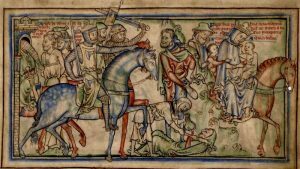 The Life of King Edward the Confessor. I believe that Emma must have been made of pretty stern stuff. She was of Viking stock, through both her mother and her father, and although she never hefted an axe or a sword, in her prime she wielded the powers of an early medieval queen. She lived in a time that was ruled by the sword and in a kingdom ravaged by war. Men, especially kings, had to be ruthless, and Emma was wed to two of them. She may have been a little ruthless herself when it came to negotiating with the fierce men around her. She is the only woman to be crowned Queen of England twice. 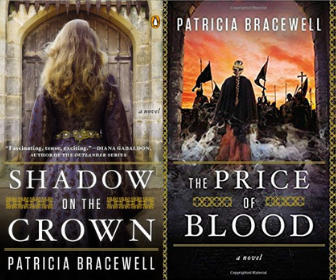 In my novel SHADOW ON THE CROWN, fifteen-year-old Emma learns that she is to marry an English king—a man haunted by guilt, by fear, and by the baleful ghost of a murdered brother. She finds herself in a hostile court that is riddled with intrigue, where even her husband is her enemy. In THE PRICE OF BLOOD, she is a queen with children to protect in a kingdom torn by divided loyalties and plundered by viking armies. She faces treachery and betrayal with strength, courage and intelligence, and the choices she makes, like those made by that historical Queen Emma, will determine not only her fate and that of her children, but the fate of England itself.